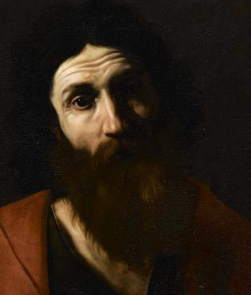 Although Tournier is one of the most significant of the French Caravaggesque painters, little is known of his life before he is recorded in Rome at the age of twenty-nine years. 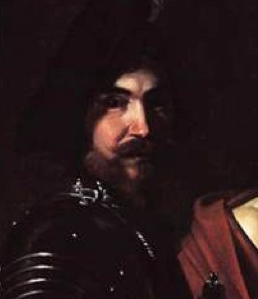 One source suggests that he was a pupil of Valentin de Boulogne, but his strongest stylistic connections are to Bartolomeo Manfredi and to Caravaggio himself. The present painting has only recently been identified as a work by Tournier from his period in Italy. When sold over twenty-five years ago, then heavily obscured by discolored varnish, it had borne a tentative attribution to Matthias Stomer. Jerome is presented solitarily and nobly at his desk, a large book open before him, gently propped up by two smaller tomes and held in place by his left arm. His right hand holds a quill poised over an inkwellas he raises his head in contemplation of what he is about to write. To the right rests a skull, the traditional emblem of the saint’s meditation, and an open book, no doubt the Bible, which Jerome famously translated into Latin. There are many stylistic analogies with works recognized as being from the Italian period -- a group of approximately twenty paintings, all without chronological or documentary order, which makes the Tournier “case” among the most problematic and mysterious of the Caravaggesque world. In contrast the succeeding period of the artist’s career in Languedoc is full of both paintings and documentary records. The physical type of the saint reoccurs throughout the work of the painter. One finds it, for example, in the armored soldier (the third from the right) in the Dresden Guard Room (fig. 1) or in the face of the person in the background who is seen head-on attending to the Meeting of King Solomon and the Queen of Sheba (fig. 2) in the painting of unknown location which I published, attributing it to Tournier, on the occasion of the conference in Toulouse in 2001. [iv] In that same painting the figure with a turban at the left (fig. 3) has the same facial and nasal structure, as does the face of St. Paul (fig. 4) in the Musée des Augustins in Toulouse, both with the identical highlight at the tip of the nose and with large black eyes. Very similar as well is the frontal orientation of the face in the St. Paul (fig. 5) in the Musée Fesch in Ajaccio and the figure in armor at the extreme left of the Dice Players in the Speed Art Museum in Louisville (fig. 6; for reproductions of all the cited works other then the above-cited King Solomon, see the catalogue of the 2001 exhibition Nicolas Tournier 1590-1639. Un peintre caravagesque). [v] The drapery of the mantle, of heavy material with wide and deep folds, finds clear parallels with that in the Flutist in Brescia (fig. 7) and with Christ’s robe, both similarly red, in the Suffer my Children (fig. 8) of the Galleria Corsini in Rome, where one finds as well strong analogies in the structure and the pictorial treatment of the hands in relation to our St. Jerome. As I stated at the beginning, none of Tournier’s works in Italy has a firm date; it is therefore difficult to establish a chronology of the corpus of paintings belonging to the approximately ten years that the artist’sItalian (predominantly, if not exclusively, Roman) sojourn plausibly lasted. Thus for this St. Jerome one can only suggest a hypothetical dating: belonging to the full maturity of those years and therefore to be dated close to the middle of the 1620s. [i] Dr. Papi’s original text in Italian is available upon request. [ii] Alla ricerca di “Ghiongrat”; studi sui libri parrocchiali romani (1600-1630), ed. byRosella Vodret, Rome, 2011, p. 450. [iii] Roberto Longhi, “I pittori della realtà in Francia, ovvero i caravaggeschi francesi del Seicento,” in L'Italia letteraria, June 19, 1935, pp. 1-6; reprinted in Paragone, 269, 1972, pp. 3-18. [iv] Gianni Papi, “Tournier e le sue relazioni con l’ambiente artistico romano,” in Nicolas Tournier et la peinture caravagesque en Italie, en France et en Espagne, Acts of the conference, Toulouse, June7-9, 2001, ed. byPascal François Bertrand and Stephanié Trouvé, Toulouse, 2003, pp. 103-114. [v] Nicolas Tournier,1590-1639: un peintre caravagesque, exh. cat. Musée des Augustins, Toulouse, Paris 2001.